We had some excitement on On Delay. 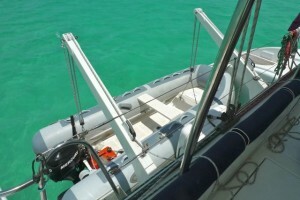 We almost lost of our dinghy; we hadn’t fastened it securely enough to the boat when we returned from grocery shopping. If it hadn’t been for our sharp-eyed and quick swimming guests, we’d have lost it (or at least suffered the embarrassment of having it returned to us by one of our neighbours in the anchorage). Anna politely drew our attention to the dinghy untied and drifting about 10 feet from the boat. Kathy was wearing a swimsuit but by the time she got flippers on the dinghy had a good head start. The current and wind were strong so it was quite a swimming feat to catch up to it. Kathy grabbed hold of it and stopped its progress to sea by swimming it slowly back towards the boat. This gave Pete time to get trunks and flippers on and swim out to meet Kathy and the dinghy and Kathy. Pete then climbed into the dinghy, helped Kathy in and motored back to On Delay. Big thanks to Anna and Kathy for saving our dinghy. Here is the dinghy now. Securely hoisted on the davits and tied by the painter at the front. This entry was posted in Aruba by Jane. Bookmark the permalink. OK, I’ll be the first. The dingy dinghy day. Nobody flipped out, and Kathy and Pete flippered in. Good On Delay story; a bit of an adventure.